Formation Team Group Class – 7:30 PM – 8:30 PM. The cost of the Formation Team Class is $15.00 per person per evening. The Formation Team meets for the Class and practice, every Thursday night from October 9 through mid-December. Team Members commit to come to each Formation Team Class and practice session. If you have to miss a class, however, it may be possible to take a private lesson to catch up. 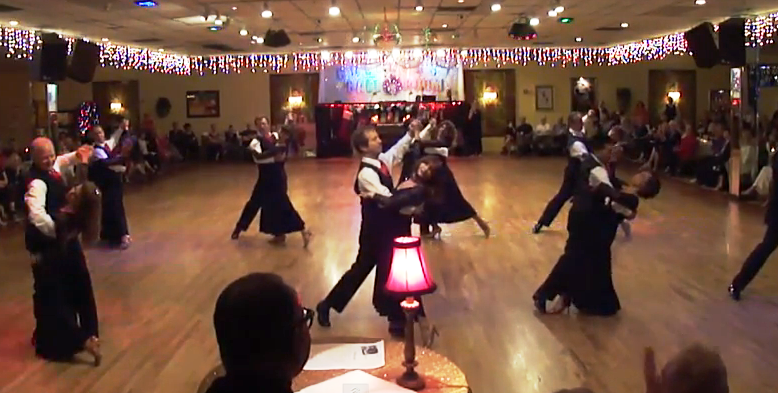 The Goldcoast Ballroom Formation Team, under the direction of Liene & Paolo Di Lorenzo, traditionally performs a medley of international standard, American Smooth, and Show Dance numbers at our December Showcase, and also at our year-end Holiday Parties. The Team always receives thunderous applause, and it’s lots of fun, and a chance to learn great new choreography. For more information about the 2014 Goldcoast Ballroom Formation Team, Contact Liene & Paolo Di Lorenzo (paolo.liene@yahoo.com or (201) 334-8966). Preceding the Formation Team Class on Thursday Evenings, Liene & Paolo teach a Competition Class (Ballroom & Latin Rounds) – 6:30 PM – 7:30 PM. Come and learn how to compete in dance competitions! Practice in simulated International Standard and International Latin competition rounds during the class! Following the Formation Team Class on Thursday Evenings, Paolo & Liene teach their International Standard class (8:30 PM – 9:30 PM), including a Supervised Practice Session (9:30 PM – 10:00 PM). In December, the International Standard class will be on International Viennese Waltz. The cost of any one of the three Group Classes taught by Paolo & Liene on Thursday Night (including the Supervised Practice Session from 9:30 PM – 10:00 PM) is $15.00 per person. You can attend any two of the Thursday Night Group Classes (on the same night) for only $25.00, or if you are a member of the Formation Team, you can attend all three Thursday Night Classes (on the same night) for only $35.00!